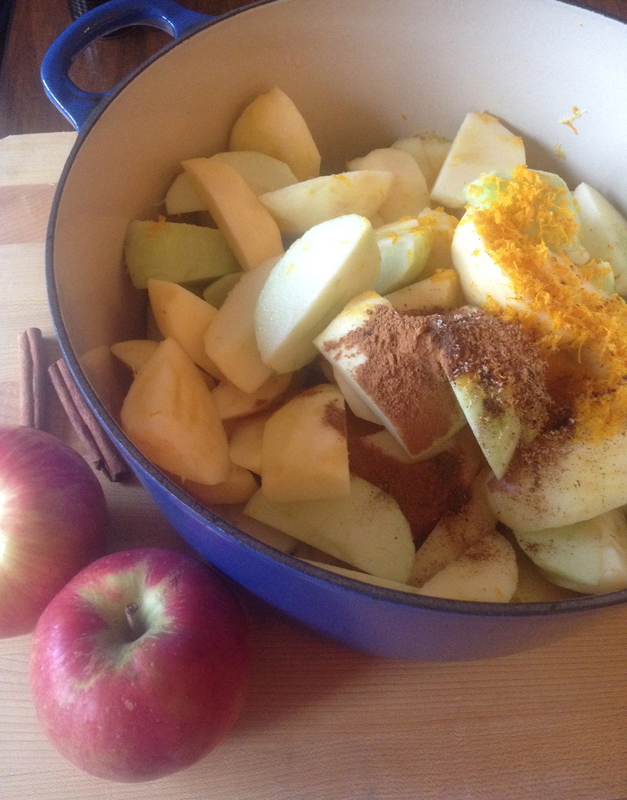 The wafting smell of baked apples….a hint of nutmeg…. the thought of apple pie but healthier, as homemade applesauce! I made a pot of applesauce on Saturday and it’s already gone. My family ate it right out of the pot. Toss in some toasted walnuts or pecans, to add a little zip. This recipe had butter and brown sugar, but I changed it up by omitting both, and adding maple syrup. You can skip the sweetener, and still enjoy the wonderful fresh flavors. Place the zest and juice of the oranges and lemon in a large bowl. Peel, quarter, and core the apples (reserving the peel of 2 of the red apples) and toss them in the juice. Pour the apples, reserved apple peel, and juice into a nonreactive Dutch oven or enameled iron pot. Add the maple syrup (if using), nutmeg, cinnamon, and allspice and cover the pot. Bake for 1 1/2 hours, or until all the apples are soft. Remove and discard the red apple peel. Mix with a whisk until smooth, and serve warm or at room temperature. What a wonderful recipe. I have made apple sauce for years on top of the stove, but I am sure this recipe has a more intense flavor. I will have to try it. Thanks. Love apple sauce! I’d have to try this! Thanks Pam! This looks amazing! Can’t wait to make it! Robert is doing the Thursday Waltham clinic – sure wish Lucas was too. Have a great weekend!